If you're on a mission for a casual yet totally stylish ensemble, team a Goosecraft suede biker jacket from Asos with black skinny jeans. Both pieces are totally comfy and will look fabulous together. Choose a pair of brown leather lace-up ankle boots to instantly up the chic factor of any outfit. If you're all about relaxed dressing when it comes to your personal style, you'll love this adorable pairing of a Goosecraft suede biker jacket and navy ripped skinny jeans. Take a classic approach with the footwear and rock a pair of black leather platform loafers. If you're on the hunt for a casual yet totally chic outfit, opt for a Goosecraft suede biker jacket and blue skinny jeans. Both garments are totally comfy and will look fabulous together. If you're all about functionality dressing when it comes to your personal style, you'll love this super cute combo of a Goosecraft suede biker jacket and blue ripped jeans. 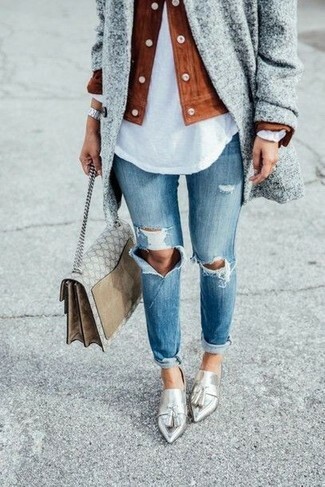 Add a glam twist to your getup with silver leather tassel loafers.